Ferret Supplies List - What to Buy? Ferret supplies are a must if you plan on owning one or more of these animals, but what will you need to get before you bring your pet home? A list of the items you will need can be found quickly online, and some of these lists may include optional items like treats as well as the basic necessities. Ferret cages are the first list item you will need to buy, and the cage should include a second floor and offer plenty of room for your pet. A bowl for food and one for water will also be needed, but some cages will include these accessories. Ferret supplies for grooming your animal will also be needed, and this can include shampoo and odor remover. You will need to provide a quality ferret diet for your pet, and these animals need a diet high in fat and animal protein, with little fiber included. Cat food may not be ideal for your ferret, and there are many ferret diet products that will meet your pet’s nutritional needs better. 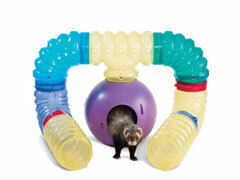 A list of ferret supplies should also include a collar, leash, and harness, so you can take your ferret outside to play. With a harness and leash you can take your pet for walks safely, and prevent them from running off. A pet ferret is curious and mischievous, so keeping your pet close is a good idea when you are outside. Other ferret supplies that should be on your list includes ferret toys, because your animal will need something to play with that is fun and mentally stimulating. Without toys and companionship your pet may not have a good life, and they may start to behave aggressively. A litter pan and litter should also be purchased. You can include ferret clothes on your list, but these accessories are optional unless they are needed to keep your pet warm in cold weather.